Ultimecia Castle is the final destination in your journey. There are a few special rules here that make it an interesting dungeon. First, the party splits up into two groups of three. You can generally focus on one party or the other, but there are a few cases where you'll need teamwork to proceed. Be ready to switch junctions if you haven't distributed them across the whole party. Note that you can swap the members within your parties, but only if both groups are standing on the same switch point. The second wrinkle is that eight of your abilities have been sealed and are initially unsuable. They include the four basic commands (Item, Magic, GF, and Draw), the group of all other command Abilities, Limit Breaks, resurrection, and saving. Saving isn't such a big deal since the seal is lifted if you step outside the castle, and can save there. You can leave one party near the entrance and switch to them to quickly leave if they're not otherwise needed. You need to defeat the eight bosses inside Ultimecia Castle to unlock your abilities. You can choose which ability to unlock after each, based on what your group is best at, but the bottom line is you will be beating at least one boss with nothing but the Attack command. Junctions still work in terms of passive Abilities, stat increases, and elemental/status attack and defense, so focus on those at first. Note that, unlike most bosses, you can run from these bosses. Keep this in mind if you run into a boss you can't defeat with your current set of powers. You can generally walk around the bosses as well if you don't want to fight them. The random Encounter rate in Ultimecia Castle is very low, and you'll find almost every Monster in the game (as well as a few bosses) in various areas. Each screen has exactly four possible Encounters, though a few screens are entirely Encounter-free. The levels of the Monsters that appear here also vary wildly. All in all, this is not a good place to hunt for specific Monsters, but you need to set your junctions to be prepared for anything. The easiest boss is the one at the top of the stairs in the very first room, Sphinxaur. When defeated, it turns into Sphinxara, which will summon a Jelleye, a Forbidden, and finally a Tri-Face (though only one summon may be present at a time). There are a number of ways to go from here. The side doors upstairs connect a cycle of rooms. The bosses here are relatively difficult, and you'll need to find keys elsewhere to fully explore, so I recommend heading through the upper door first. It will take you to the same place as the lower side door—the Grand Hall. If you enter the Grand Hall by dropping the chandelier from the door behind Sphinxaur, the chandelier will drop and break the lock on the hatch on the floor. This hatch leads to the wine cellar, where you'll find the boss Tri-Point. You can have your party stand on the party switch point in the Grand Hall to keep the chandelier from falling. Switch to the other party and have them cross the chandelier to find a third boss, Krysta. You can also head through the door at the back of the lower Grand Hall, which will lead to the courtyard. 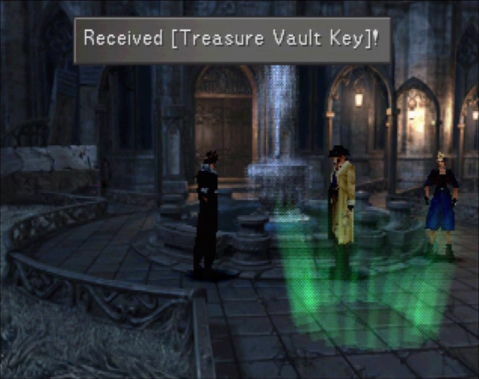 Search the fountain to find the treasure vault key. Continue on through the chapel to reach the bridge to the clock tower. Walk, do not run, on the bridge to reach the armory key that lies on it. If you run, it will fall down. However, its final resting place is right near the door it opens, so it's no big deal if it does fall. Once you have both keys, it might be a good idea to return to the entrance and take the right door on the second floor of the entrance hall. This will lead to the art gallery. If you want to save some time later, make sure the party you send contains no more than one female Character. Combine the general ordering with the clock on the floor, and it should be apparent that this puzzle has to do with Roman numerals. Specifically, you want to look at the I's, V's, and X's in each name, and correspond the paintings to numbers. The hour hand points at VIII, minutes at IIII, and seconds at VI. Go to the painting with no inscription and choose the three inscriptions in that order (you must inspect them before you can choose them): VIVIDARIUM INTERVIGILIUM VIATOR. Solving the puzzle will cause Trauma to appear. Trauma will immediately summon two Dromas, and will resummon them after a time if they are defeated. Beyond the art gallery you'll find a staircase descending to the flood gate area. You'll find a locked door on the right side which requires the armory key to unlock. (If the armory key fell off the bridge outside the clock tower, it will be found in the water in this room.) Within the armory is a hidden Ultima Draw point and the boss Gargantua. If you enter the prison cell, it locks behind you. The prison key is inside the cell, but picking it up causes the Red Giant, another boss, to appear. (Meltdown, possibly drawn from the Art Gallery, will break its defenses.) There is also a hidden Full-life Draw point in here. If your party has at least two men in it, now is a good time to switch to the other party. If you proceed through the left door upstairs in the entrance hall, you'll soon enter a skewed hallway where lightning periodically flashes. Search the left side for a door locked with the treasure vault key. Inside you'll find a puzzle featuring four treasure boxes. Every time you open or close a box, any adjacent boxes are also changed from opened to closed or vice-versa. Your goal is to open all four boxes at once. The middle two boxes are closed to begin with, which makes the solution simple: use all four boxes once each in any order. This will cause Catoblepas to appear. If you continue down the hall past the treasure vault, you'll come upon two elevators. Have a party featuring no more than one male Character stand on the lower elevator, then switch to the other party and have them stand on the higher elevator. Switch parties, then use the first party to investigate the storage room and retrieve the floodgate key. This key is not vital to the fight against Ultimecia, but unlocks some nice treasure. To use the floodgate key, return to the flood gate room. Use the key on the switch outside the prison cell to unlock the flood gate. Use it again to dry up the waterway outside the clock tower. Now return to the chapel and play the organ. (This might be a good time to use two parties.) You need to play all eight notes at once—hit all four face buttons, both L buttons, and both R buttons. Then take the bridge right from the courtyard to a short hall. There is a grate there with eight parts, and one part will be open for each note you pressed—if you missed any, you won't be able to pass. You'll find a Rosetta Stone on the floor of the walkway. The door on the bottom of the screen is a one-way door back to the prison cell. The clock tower requires no keys or puzzle solving, and leads to Ultimecia. You'll also find the eighth boss, Tiamat, here. After climbing the tower for a while, you'll see a bell swinging above you. Note that there is a platform with an exit right of the bell. You'll want to jump on the bell from the other size to reach that ledge. That's where you'll find Tiamat. There's a hidden Triple Draw point behind Tiamat, but you can't reach it without defeating the boss. Continue to the top of the tower and climb out the face of the clock to reach the final save point before Ultimecia. It's time for the final battle! Once you enter the Master Room, you're in it until the end. Ultimecia will randomly choose three party members to start the battle with. If anyone stays KO'd for any length of time, they will be removed from the battle and replaced with another party member. Even if you've used all six members, KO'd Characters will still disappear, leaving you with an undersized party. Ultimecia's first form is pretty straightforward. When she is defeated, she summons Griever (Fun fact: Griever's name is whatever you gave to Squall's ring earlier in the game. ), who has the annoying ability to wipe out your stock of random Spells. Her next form is quite strange, and will summon two Helixes during the fight. They are tough to kill, but with both out, Ultimecia gains access to very powerful attacks. Eventually this form will be broken in half and lose the Helixes. Ultimecia's final form can be nasty. At some point and without warning, a lower portion will appear, and the upper part of Ultimecia will Draw Apocalypse from it. Destroy the lower part quickly to prevent this. Once Ultimecia starts talking, just keep attacking—she's out of HP, but you must still hit her a few more times to make it final. Omega Weapon is an optional boss that is incredibly difficult—far surpassing the difficulty of the final boss. To find Omega Weapon, you'll have to use two parties. Form a battle party and head to the switch point in the courtyard. Switch to the other party and have them head through the right door on the second floor of the entrance hall. Have that party pull the rope at the bottom of the stairs to ring a bell above. A timer will start, giving you about 45 seconds to get to the chapel (where you probably noticed a dark cloud gathering earlier). Switch to the first party and head to the top of the screen, and get ready for a hell of a fight. You might want to use Diablos's Enc-None Ability to ensure that you can get to Omega Weapon in time. Note that, like the other bosses in Ultimecia Castle, you can run from Omega Weapon if you need to.